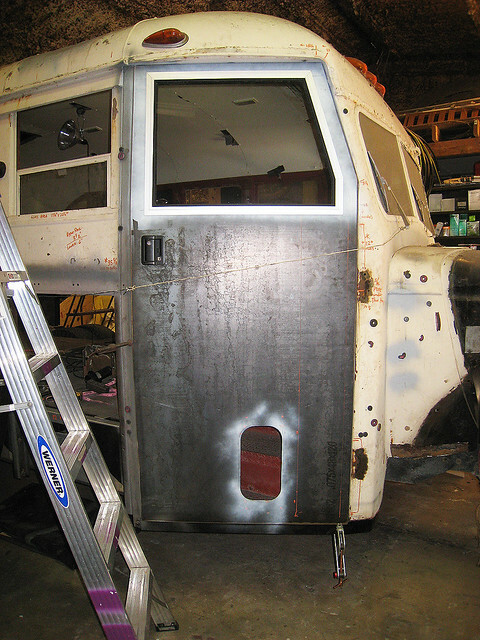 I will be skinning the original door so its a solid door but is still a school bus door. I wondering if i can recycle the sheetmetal from the ceiling? How will you see out? I’ve thought of that but you need visibility there. I agree...you definitely need some vision in that spot so some kind of window is called for. I even added a small "curb view" window down real low. Helps a lot when ooching up next to gas pumps and such. I will be cutting 4 windows in the sheet metal to match windows in the door. Did you create this door or just skin it? Made from scratch. And a nightmare! The leading edge is straight but the back edge has a tiny amount of curve. If you build a proper door frame, then skin it , it should fit. And mine did. Prewfectly. But...if...after the skin is on (14 ga. in my case) you come back and cut out a big area (like that large window)...it just may crank itself out of shape due to relieving some stress across the skin. Maybe 3/8's of an inch now out of alignment (along the "straight" edge). Still need to correct it and still uncertain as to exactly how to go about it. A buddy at the sheetmetal shop that did the skinning thinks he can torque it back where it should be but we don't know yet. That sucker took a couple of months (and a fair amount of $$$) to build so I am reeeaaally hoping we can correct it. Does your door have body contours your trying to match?